5 Totally Fetch Life Lessons 'Mean Girls' Is Still Teaching Us Today! What day is it? It’s October 3rd -- MEAN GIRLS DAY!!!!! It’s especially magical that this Mean Girls Day just so happens to fall on a Wednesday. And ya know what we do on Wednesdays? We wear pink, DUH! Since it’s been 14 magical years since Cady Heron told Aaron Samuels it was October 3rd, we thought we’d celebrate by highlighting the most vital lessons Mean Girls has taught us... and continues to teach us a decade-and-a-half later! So sit down, grab some popcorn (or cheese fries), turn on the movie, play the Mean Girls Broadway soundtrack, and let’s reminisce. When entering a new environment, BE. YOURSELF. This is the biggest lesson we can learn from this movie. Don’t pretend you’re bad at math so the hot senior will tutor you… and then subsequently fall in love with you. He probably would have liked you just as much by getting to know you as the girl who sits behind him in Math. You don’t need a whole big plan where you to pretend to be something you’re not just to get someone to like you. Don’t turn into the “Plastics” to fit in with them. Wear sweatpants, wear the white gold hoops, wear what YOU want. Don’t let anyone tell you who you can and can’t be! The people you’ll want to spend your time with will love you for exactly who you are. If you befriend the new girl, don’t set her on a mission to play double agent to destroy the mean girls. Usually, when girls are mean, it’s because there's something much deeper-rooted going on with them. If they’re mean to you or to someone else, it’s usually because they’re deeply insecure about something and just need to pick on others to feel better about themselves. And while it isn’t right, it doesn’t mean you should actively plan their demise and attempt to destroy their lives. Don’t try to destroy her relationship or her friend group. Let ‘em live and kill ‘em with kindness, it might teach them something! Stop worrying so much about body image. You are beautiful just as you are. You don’t need to lose 3 pounds and go on crazy diets to be beautiful. Love the skin you’re in. Be confident in who you are and how you look and the rest will come to you. Just live yo best life and say, “Whatever, I’m getting cheese fries” (thanks for the advice, Regina). Also, if your “friend” is actually trying to lose weight and you’re mad at her one day, DO NOT give her bars that will make her gain weight!!! What the heck, Cady?!! Support your friends if they’re on that journey, but always reassure them that they look great at any size. If you want to know if someone is mad at you, ask them. Be honest with your friends! It shouldn’t require a shady 3-way call where one person doesn’t know the 3rd party is present to find out if one of your friends is pissed at you. Talk to them yourself! It’ll work out so much better for everyone in the end if you approach them and talk it out like FRIENDS should. Also, don’t be the shady friend that organizes the 3-way call. Let your friends figure out their issues, and don’t get in the middle of it! It could only hurt your friend group more if you get in the middle when you weren’t even involved in the issue in the first place. 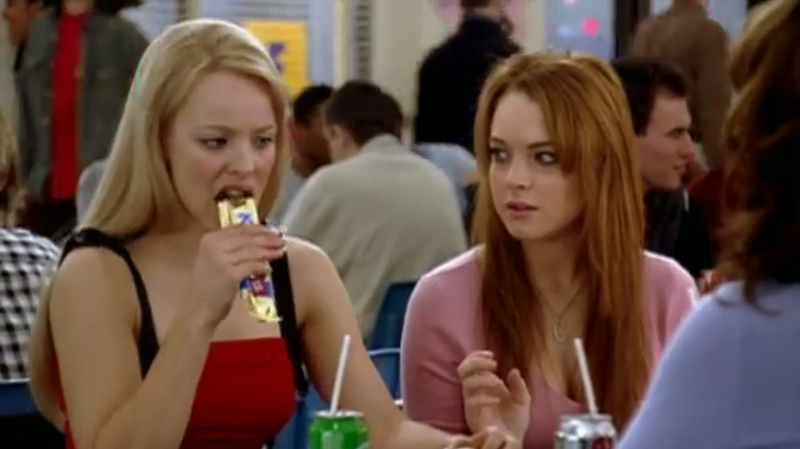 Are there any other major lessons YOU’VE learned from Mean Girls? 14 years later, the film is iconic and can always continue teaching us new lessons about ourselves and the society around us. Have a totally grool (or fetch) day celebrating Mean Girls! Now, if you’ll excuse me, I have to go watch Mean Girls on repeat and then listen to the Broadway soundtrack a million times. The limit of how much I will do these things today doesn’t exist! Love ya, byyyyeeeeee!